It is only the 14th day of Ramadhan but seems like many have already in the mood for Raya including the folks at LINE. For starters, the popular instant messaging platform have just announced that they are giving away free LINE Raya envelopes (shown above) at selected locations such as BHPetrol stations, Chatime outlets, Chaswood restaurants, Nokia outlets and on-ground events by HotFM. 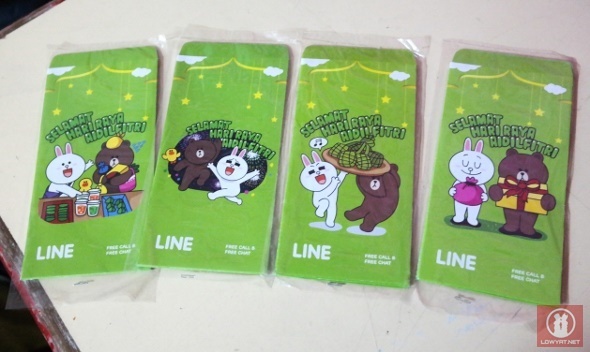 In addition to that, LINE has also rolled out a special set of eight stickers for the festive season. As per other signature LINE stickers, these limited edition animated stickers features the well-known LINE characters – Cony, Brown, Moon and Sally – performing various traditional customs that is related to Ramadhan and Aidilfitri. Users are able to utilize these stickers on LINE Camera as well. Meanwhile, the popular instant messaging platform has also unveiled the Official Accounts for three local celebrities: Neelofa, Nazim Othman and Fizo Omar. Of course, you might be already aware of them since they have appeared on new LINE commercials that already went on-air since earlier this month. [L-R] Nazim Othman, Neelofa and Fizo Omar. For those who are not familiar with the LINE’s Official Account, it basically allows users to add celebrities or brands and follow their updates directly through LINE. In fact, users are able to actually interact with them in real time whenever the “On Air Mode” is activated. All users got to do is just add these Official Accounts to their LINE contacts…no, we have no idea how frequent Neelofa activates “On Air Mode” on her LINE Official Account. Available for Android, Blackerry, iOS, Windows PC, Windows Phone and Nokia Asha devices, the LINE app can be downloaded for free over at the app store on respective operating systems. Alternatively, more information about the platform are also available at line.naver.jp/en. Nokia To Launch “Something Big” Today: Is It Another Lumia Smartphone or A Tablet?